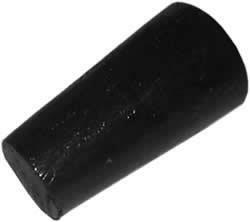 7/8" to 1 1/4" tapered asphalt plug for 1" tent stake holes. Our tent stakes are 3/4" diameter, but a 1" hole is required to drive the stake in (you cannot drive a 3/4" stake into a 3/4" hole and expect to pull the stake out). * Please call us with any questions about our stake plug asphalt 7/8 1 1/4 inch in Oak Grove MO, Blue Springs MO, Independence MO, Lexington MO, Odessa MO, Independence MO and Western Missouri.